See also Bubble by jihan, ePic A Venus by Sajan118. "A letter within a letter" concept, where small ones are inside of capitals and vice-versa (mostly), giving it an unintentional outline effect. Thanks. Info: Created on 4th February 2012 . Last edited on 10th February 2012. I've seen some works here, including awesome Infix, and I think everybody should do "smth inside of a letter" concept, it'll certainly improve your fontstruct level. The letters inside mostly have the same height. Congratulations! FontStruct Staff have deemed your FontStruction worthy of special mention. “Venus” is now a Top Pick. Thanks everybody for commenting and for the TP! Your Infix is really cool, thanks for sharing it! I've changed them now a bit by connecting some ends, hope this gives them a bit more realistic shape. @CMunk: If somebody ask me, I like veeery much your font "Infix" (10/10 http://fontstruct.com/fontstructions/show/252718), but I like "Venus" font too! Can both universes to live togethers? I hope it's possible. But the St Valentine day touch of Venus (we're straight on the period) has also its charm, even if globally i'm a bit less in phase with it. Maybe with "these" particular shapes i think i would prefer the same glyph inside the big shape, i mean Uc with Uc and Lc with Lc inside. But it's only my personal taste. You're the captain on the boat of your work. 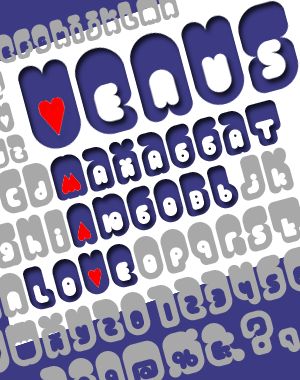 Yeap, I remembered St.Valentine's coming soon, and it was actually at the end of finishing this font when I realized that "v" looked like heart. Махаббат means love in kazakh, so for cyrillic I also had to change the look of an "m". Concerning the "t", i really prefer the one at the left, the right one you finally chose is too wide for me with other letters, and it is not fitting well with the general style; more soft and rounded. Same remark for its white reverse form, it would be much better if the small white UC was shaped as the one at the left on your sample, in my opinion. Oh, it's not exactly the one at the right you finally chose but it's also too wide, i still prefer the one at the left of your sample, much more fitting with the global style in my opinion. May I give an opinion? The left one is OK, but me myself prefer the right. I think I also like the left one, I didn't mention about it cause the idea for it came when i was redrawing those other two. So, already changed it, but anyways, alternatives are available, they're next to "oe" character. Thx. Actually, I like the original version of "T" too. Only.. The P,R & Q are a bit strange. It's like they want to escape from there darker shell. This font was used for the logo of ball pool project called BABABA. Info and video can be found here: www.bababa.nl. Also, a corporation from Japan asked permission to include this font alongside Dalmat, Rap My Hip-Hop, Arro in their book for designers, artists etc (I'm sure other FS users also received this message), but I'll upload samples later, when I receive the book. Congrats for the achievements! The logo works great here, I like the colors (especially with the yellow background). Congratulations - great to see your work in action. Congratulations, very appropriate use of an excellent font!